The fall of a rebel musician. Gosh, how long as the Enigma project been around for? Over a quarter century, is it? Indeed, Enigma, the brainchild of Romanian-born Michael Cretu, put the new age genre of music back on the map way back in 1990 with his groundbreaking album, "MCMXC a.D.", which has since sold over 14 million copies worldwide. Since then, he has been consistently challenging himself in the six albums that followed. Yet, after 2008's "Seven Lives, Many Faces" album, Enigma went relatively silent, save for "The Social Song", a collaboration between himself and fans worldwide in 2010. He finally resurfaced in 2016 with "The Fall Of A Rebel Angel", the eighth major Enigma work, cited as a concept album. 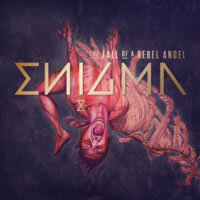 Of all the Enigma albums I've heard yet, The Fall of a Rebel Angel is by far the slowest and least powerful. Focusing heavily on ethereal pads above all else, the album is more about atmosphere than of melody. It's supposed to be a journey, that of an individual, dissatisfied with himself, going forward to seek a new life. The entire story, concocted by Cretu himself and German lyricist Michael Kunze, is told in a series of separate tracks after the main album and is available in English, French, and Spanish on the deluxe version only. But the main adventure, the primary songs, are unremarkable. Starting out with Circle Eight, where the signature horn heard on every album cries out once more, gives us the voice of Nanuk, introducing us to the album over very downtempo padding before we roll into The Omega Point. Complete with pizzicato plucks and the strange sounds of mechanical wind-up toys as percussion, this wouldn't be too out of place in an investigative scene on Criminal Minds. In fact, this is probably the entire soundtrack of those gruesome crime shows in a nutshell. For relaxed home listening or driving tunage, however, this one won't keep you going for long. Following up is Diving, a very calming song that I actually really enjoyed, especially the main harmony. Initially driven by piano, there is a shift to crashing waves and slightly hoarse pads, not unlike ones heard on the previous album. The next song, The Die Is Cast, introduces the first of several new voices to the Enigma project, as past mainstays such as Andru Donalds are nowhere to be found. Brazilian singer/songwriter Mark Josher makes his one and only appearance here, sliding out a few boy-bandish vocals over mediocre ethereal backing. The only notable change here is the beat itself, which is far more wiry and mechanical than I've heard in the past from Enigma's music. It's a nice change, but it doesn't save the song much. Mother is another chill track, reminding me very much of Enigma's music from his first album in 1990 or perhaps the relaxed electronic music of York. It features Indonesian vocalist Anggun, who will pop up a couple more times. Featuring smooth whispered words only, Mother offers a blurred guitar for its main melody, almost like a tidal beach track for a sunset. Then, the Lamb of God, or Agnus Dei, rears its head, another pad-heavy excursion into slightly powerful territory with its grinding bassline and twitchy percussion edging it along. If this song represented an ACTUAL lamb, I'd stay away from that lamb because it's probably dangerous and has rabies or, at minimum, a mild flu bug. In 1990, "Sadeness (Part I)" was released to great success worldwide. In 2016, twenty-six years later, Sadeness (Part II) finally came to fruition — regardless of the fact that Part II was actually on that same album titled "Mea Culpa". Although mildly a letdown on first listening, it's grown on me a bit. I admit, the organ playing Bach's "Toccata and Fugue in D Minor" as the hook at first sounded cheesy and out of place, but eventually it settles. Later on, Anggun returns to belt out some powerful vocals that turn the track around; she's underused, however, and only sticks around briefly before the song suddenly ends. Following this is Lost In Nothingness has only two chords, and it bounces back and forth between them. Oh, they're quality chords, mind you, but so little is done with them that a song that sounds as though it has potential ends up being very disappointing. Oxygen Red tries to step a little into more modern territory by chopping up some vocals into seemingly randomized chunks, as "current" music often does, and it does create something interesting for the ears. Oxygen Red is one of the more powerful outings on The Fall Of A Rebel Angel and is also the last track to feature Anggun. Confessions Of The Mind takes the album in the other direction, offering a slow chugger with a faded piano crooning out a melancholy tune before we are lead right into a digital church, complete with a massive organ dénouement. Absolvo is fairly short, and aside from throwing in some rather out-of-place fake saxophone synth tones, is a forgettable bridge toward Amen, the finale featuring British duo Aquilo. Their vocals heartfelt, their message clear, this one's a powerful conclusion to this dream-lit journey we've experienced as spatial pads and booming crashes line the background. Though the album is well-crafted, The Fall Of A Rebel Angel often feels like it's lacking in strong substance. It seems as though Cretu has really simplified the formula for an Enigma album to the point where a few dream pads is all it takes sometimes. If the goal was to help me drift to sleep, this album does wonders, because this is not the thought-provoking, mystical sound I have come to expect. Instead, there's a blandness, a sterility, that simply cannot be shaken. The Fall Of A Rebel Angel isn't poor; it's just not rich.